We know the Mexican reaction to Donald Trump—one of disgust, fear and concern. But what about our neighbor to the north Canada? Interestingly enough it is the same—disgust, fear and concern. While the United States and Canada share the longest open border in the world, there is a fear that if Donald Trump should ever be elected president that may change. Many Canadians fear Trump may try to build a border wall between the United States and Canada. While I personally doubt this, with how unpredictable Trump is I will not put this one past him. There are many Canadians who fear that Trump will try to limit travel between the United States and Canada both for Americans and Canadians. While again I do not see this as likely, I cannot put it past him. The frightening thing is that Trump seems to represent all of the worst things that America is. To most Canadians, Trump is a racist, a bigot and a possible dictator in the making. Strangely enough most Mexicans and a growing number of Americans also view him this way. For decades, Canadians have spent so much effort at making Canada a more multi-cultural, inclusive country for not only the native-born but also for those immigrants who move to Canada. To see a person like Donald Trump—who has vowed to ethnically cleanse the Mexicans from the United States, limit the number of Muslim immigrants, and even require Muslims to carry special government identification—is scaring the crap out of Canadians. 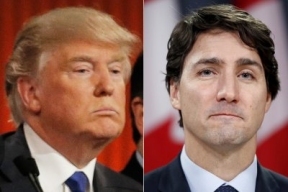 For many Canadians, Donald Trump is the focus of all the dark, backward and xenophobic forces within American society that has come to the fore. Can these forces propel him to the White House? Many Canadians do not believe so, but like everyone else we simply do not know. For so many Canadians, a Donald Trump presidency would be a dark age for not just the United States but also for Canada and the world. Come November we will know the answer.